Yesterday, 4C hosted a Social Advertising Master Class webinar on LinkedIn. Our guest speakers included Andy Goldman from LinkedIn, Maddie Guy from Resolution Media, and our own LinkedIn Product Manager, Jen Wormington. Here are links to the recording and presentation. Read on for a full recap of the session and key takeaways. The conversation was lively and we covered a lot of ground in an hour. After some intros and a review of the agenda, we had our first attendee poll and asked what their most important advertising goal is on LinkedIn. It’s always good to understand the makeup of your audience and what’s important to them whether it’s a webinar, classroom setting, or conference panel. I would imagine most LinkedIn marketing campaigns are somewhat geared to address all four objectives, but we asked the attendees to pick just one. Clearly, this webinar was swell attended by social advertisers because the top response was “Direct Clicks to Action” with almost half (46%) of the attendees choosing this option. “Promote your company’s content” was the second which wasn’t a surprise given LinkedIn’s prominent role for content marketers. The first topic was how the speakers view LinkedIn’s place in the marketing ecosystem. On one hand, as a social media destination, it is similar at a top level to others like Facebook and Twitter which enable community communication and sharing. However, very quickly, the conversation turned to how LinkedIn has a very unique position as being the top destination for professionals. While consumers passively consume content on most social networks during their leisure time, the LinkedIn user base is interested in active professional development by learning more on how to move the needle on the careers as well as sharing content to their own network. We then dove into Sponsored Updates, which is the fastest growing ad format in LinkedIn history. After discussing the value of SUs, I shared aa few tips on maximizing their value. Run 2 – 4 Sponsored Updates a week. Run for 3 weeks, then test & iterate. Add URL tracking codes to measure post-click actions (site visits and conversions). Set up campaigns by audience. Shift budget to the audience with the highest engagement rate. First place was tie between including images (36%) and providing a clear call to action (37%). The other three choices – include video (6%), short updates (9%) and headlines that ask questions (12%) – are all still very valuable creative tactics, but certainly images that help your ads stick out from the crowd as well as clear call to actions that help drive interested professional to take action on LinkedIn are coveted Sponsored Updates best practices. We briefly discussed the importance of good measurement in all marketing, not just social advertising, but one of the highlight sections of the day revolved around best practices in content marketing including the recommended tips below. BE HELPFUL. Produce content that presents new knowledge or assists in professional decision making. BE INTERESTING. Spark conversations. Just don’t put out dull white papers all day everyday. HELP THEM HELP OTHERS. Content revolutionaries want to benefit their professional network by sharing your content. Consider sharability factor. HELP THEM HELP THEMSELVES. Sharing your content should make a content revolutionary seem smart, well-informed, clever, etc. FOCUS ON ACHIEVEMENT. Readers are consuming and sharing content to further their careers. BE EVERYWHERE. Consider how your graphics will look on a phone or tablet, because if it’s not formatted well you’ll lose trust and readers. 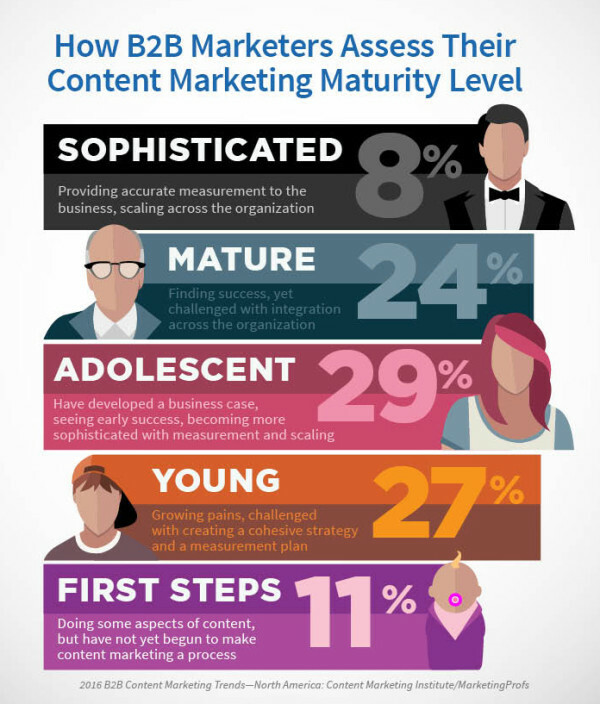 Content marketing is such a wide category, it can be difficult to move your organization forward as it can be very time consuming and requires an investment to build outstanding content that your audience finds interesting enough to either spend time to read, download, or even provide their contact information to access. The final poll of the day was to have attendees score themselves in this maturity level paradigm. Hopefully, attending this Social Advertising Master Class helped all of the attendees to get to the next level and continue to grow their sophistication with LinkedIn advertising. We ended the webinar with a section on Tips and Tricks which I won’t spoil the surprise here for those of you who plan on watching the webinar video. We had so much to cover that we weren’t able to get to our Q&A section, but here are a couple of the questions submitted by the attendees. From attendee “K.L”: Testing is a key theme that you’ve mentioned. Is there a budget range you can share to use for testing advertising? Testing is tough to sell in when the media dollars are earmarked to drive business objectives, but savvy marketers know that an investment in testing will pay off in the long run. Testing needs to be significant enough to draw strong conclusions, yet light enough not to disrupt the normal marketing plan nor waste budget. 70% goes to tried-and-true marketing efforts you can count on. 10% is the testing budget. Trying things out that might be a bit risky, but seem like they could work. There always has to be an influx of new ideas into marketing plans. If not, yes, you might do better this quarter by spending all of the budget on the safe stuff, but eventually your efforts will begin to stale and become less effective. From attendee “A.P.”: Does LinkedIn see any value in retargeting? Retargeting is a low-hanging fruit technique that takes advantage of online marketing’s ability to reach people again after being exposed to them before. After all, who best to market a big IT solution than to those people who have visited your IT section on your site and have downloaded a white paper on your product or service? There actually is already retargeting/remarketing available through LinkedIn via the Leads Accelerator product. If you’ve been following recent announcements from LinkedIn, Leads Accelerator functionality will be brought into the core Campaign Manager platform at some point this year. Thank you all that attended and to our guests, Andy from LinkedIn and Maddie from Resolution Media. I’d like to personally thank all of the folks at LinkedIn that helped us put this class together and promote the event including Phil, Andrew, Ligia, and the entire partner marketing team. We’ve received some very warm feedback from the attendees and we’re looking forward to our next Social Advertising Master Class in April with Pinterest. We’ll also circle back with LinkedIn at some point in 2016 for another webinar.